Supreme Court decisions mean that the cities generally can't charge controversial figures, such as Washington Senate candidate Joey Gibson, more money because they might attract violent protesters. Last time, nobody got hurt. Though there was a lot of concern about the presence of Washington Senate candidate Joey Gibson, whose rallies have exploded in fights between right and left-wing groups in the past, his appearance at a Spokane Valley rally last month was uneventful. But now, according to his Facebook page, he's planning an event at Riverfront Park on Sunday. "[Spokane police officers are] aware and are prepared to respond if needed," says police spokeswoman Michele Anderson. "We would respond as appropriate." According to City of Spokane Special Event Coordinator Carly Cortright, Gibson won't be required to have a permit unless his event features vendors, amplified speakers or is large enough to block public traffic. "As long as you’re allowing people to move freely, you have a free speech right to protest," Cortwright says. But the Spokane County Young Democrats sent out a press release Monday, arguing that because Gibson events have lapsed into violence in the past, he should be charged for the additional security costs. This country was built on the right to free speech, freedom of assembly and freedom of association. However, those rights do not protect you from the consequences of those actions. Due to the history of violence and property damage at Joey Gibson events additional security is necessary in order to keep the peace. We call on the Spokane City Council to pass the costs of necessary security on to the Joey Gibson campaign. Taxpayers should not be asked to bear the financial burden of the people whom Joey Gibson chooses to associate. It's an interesting question. If a controversial speaker requires a larger, more expensive police presence, should the speaker be required to pay more for the cost of those police officers? Or should the taxpayers pay the costs instead? In fact, the Supreme Court has weighed in on almost this exact issue. And it ruled that putting a greater financial burden on controversial speakers is blatantly unconstitutional. Back in 1989, the Nationalist Movement — a pretty explicit white supremacist group — wanted to protest the Martin Luther King Jr. Day on the front steps of a courthouse in Forsyth County, Georgia. But in order to do that, they were told they'd have to pay a fee, one that could vary depending on the anticipated violent reaction of the audience. The Nationalist Movement sued, and the resulting case rose all the way to the Supreme Court. The conclusion? While some security fees can be passed along to organizers of certain events, those fees have to be established in according to "narrowly drawn, reasonable and definite standards." Oh, and it's got to be content neutral — you can't charge different groups different fees because some groups may spark a more violent reaction. "Speech cannot be financially burdened, any more than it can be punished or banned, simply because it might offend a hostile mob," Justice Harry Blackmun wrote. But how about with Joey Gibson rallies, specifically? Well, we have an even more explicit case to draw from. 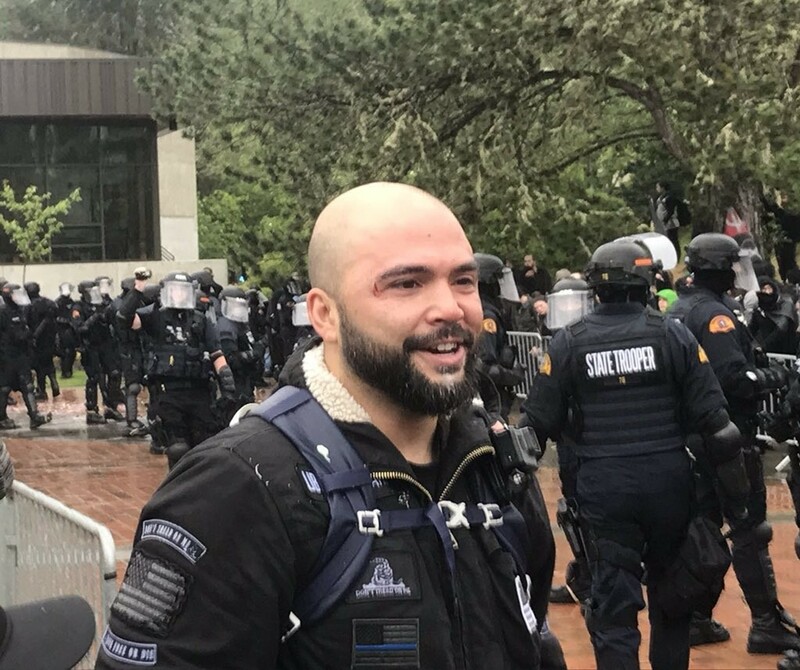 Earlier this year, the University of Washington tried to charge the UW College Republicans $17,000 as reimbursement for its security costs for a Feb. 10 Joey Gibson rally. The College Republicans sued, arguing that the university's event policy was unconstitutional. The case is still ongoing, but Judge Marsha Pechman granted the College Republicans a temporary injunction, noting the UW policy allowed the university to exclude speech based on, in UW's words, "anticipated disorderly violent reaction of the audience." Her condemnation of the policy was explicit. Relying on past protests to charge some speakers higher fees "impermissibly risks suppression of 'speech on only one side of a contentious debate." Even in a limited public forum like a university square, there's still a requirement for speech restrictions to be "viewpoint neutral." You can't punish Democrats harsher than Republicans, for example. "Allowing the UW to enforce its Security Fee Policy would infringe not only the rights of the College Republicans, but also the rights of others including supporters and protesters — who wish to attend the Freedom Rally," Pechman wrote. For colleges and municipalities, the inability to legally recoup large security costs for controversial rallies can be frustrating, leading some to lament that extreme speakers have been given a kind of "provocateur’s privilege," essentially commandeering large amount of taxpayer money to deliver their controversial or bigoted messages. Steve Hoffman, a Freedom Socialist also running for Washington state Senate who intends on counterprotesting Gibson's event, issued the following statement when asked about the issue by the Inlander. "I applaud the Young Democrats for exposing Joey Gibson's divisive, right-wing views and the white supremacists with whom he associates. But I do not agree with the call to charge the Gibson campaign for beefed-up security. That would, in effect, be a denial of free speech. It is better that those of us who oppose Gibson are organizing the community to vigorously exercise our free speech, showing everyone that the vast majority of working people strongly disagree with the alt-right." Taking the potential reaction of a crowd into account — what you're going to say is controversial, so the crowd might get angry, so we're going to charge you more for a permit — is inherently viewpoint discrimination, says Ari Cohn, director of the Individual Rights Defense Program for the Foundation for Individual Rights in Education. "Viewpoint discrimination in all cases is unconstitutional," says Cohn. "To my knowledge, there are no exceptions." Cities can ask questions like, how big is the crowd? Will alcohol be served? Is it a ticketed event? Are there going to be bag checks? "There are ways in which government officials can account for differing security needs," Cohn says. "But it has to be content neutral." That's why Spokane Valley couldn't deny Gibson's group the use of CenterPlace to hold his last rally. "The city cannot be in a position of prospectively trying to guess whether certain renters of the facility will break the rules or create a disturbance," the City of Spokane Valley wrote in wrote in response to a KXLY inquiry. "The city of Spokane Valley and its elected leadership are strong proponents of the First Amendment and the right of citizens to express themselves in lawful ways." In fact, free speech rights in a traditional public forum like a park are even stronger than a limited public forum like a college quad or city event space. “That’s what parks are for," says City Councilman Breean Beggs. "The commons, traditionally, in our culture, are for demonstrations or rallies." Beggs, a progressive councilmember, has been a free speech attorney himself. In fact, he has been involved in a case against the city over a decade ago, where the city had been charging the city's gay pride parade more money for security costs than its Martin Luther King Jr. parade. "What it led to was a total revision of the city ordinances," Beggs says. Today, city rules cap the maximum charge for public demonstrations with street closures to a maximum of $500. In some cases, national political rallies, like those of Bernie Sanders and Donald Trump, have been charged for a portion of the city of Spokane police costs. But in each case, these national politicians have simply shrugged off the city's invoices and refused to pay. When you're powerful enough, it seems, you can afford to ignore city security fees.